I have often referred to Heaven Lindsey-Burtch as the Poet Laureate Of Awesomeness. 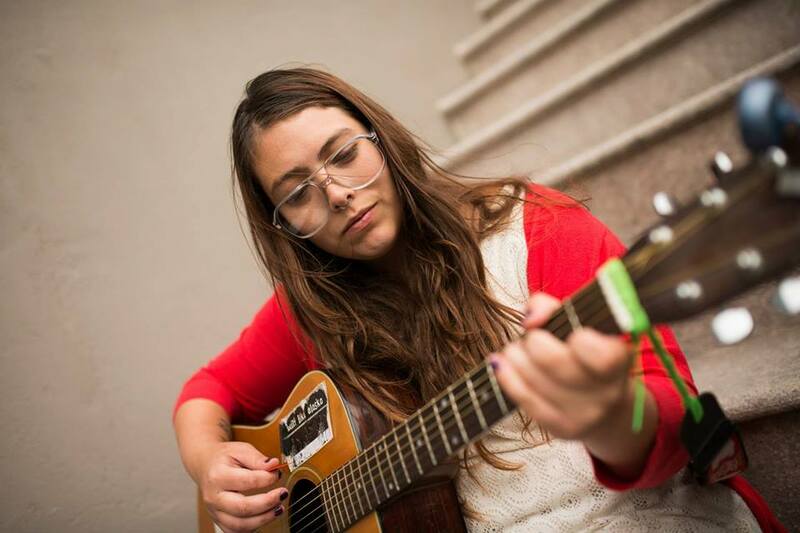 She is a triple threat of creativity: songwriting, poetry, and painting (as well as other arts & crafts endeavors.) I caught up with Heaven recently for a lovely fireside chat, where we discussed all of her artistic outlets, her world travels, and more. A.R. : Since it seems like so much of your music is really poetry set to a melody, let’s begin with your poetic endeavors. You major in English at CSU Stanislaus, and currently hold a B.A. degree. How are things coming with your studies there? H.L.B. : I just started the master’s program at Stan State for English literature, and I’m only three weeks in, so I really can’t say. So far, it’s so hard, like grad school just completely erased everything I thought I knew about English. A.R. : You were awarded the UC Riverside Chancellor’s Poetry Award back in 2009. How did that come to pass - did you spend time at UC Riverside, or have connections there? H.L.B. : Yeah, I went to UC Riverside for two years. My major was creative writing. Also religious studies, although I never declared it. I took maybe five religious study classes, and I did a year of Islamic studies. I was one class away from having an Islamic studies minor, which was really cool. Anyway, back to the creative writing thing, I was writing before I went to school for creative writing, and I just happened to see a scholarship there for poetry, and I submitted two poems and I won. And that was really cool, because out of the entire creative writing program, they picked two people for poetry and two people for fiction. I honestly didn’t think I would get picked because there were so many people who applied. It was a big honor. A.R. : You’ve had works published in multiple years of the Penumbra Art & Literary Journal, published at CSU Stanislaus. H.L.B. : I’ve actually been published in three. I was first published in 2006, when I was fourteen, and I was the youngest person to be published in Penumbra at the time, which was really cool. That was like my earlier teenage angst work, but now I try to focus on issues that are present in modern society. A.R. : Who are some of your influences, both in your poetry and your songwriting? H.L.B. : I feel like I’m mostly inspired by songwriters who also have the kind of poetic feel to their lyrics. It started early with me being around songwriters - Neil Jackson from Built Like Alaska, Joel Jerome from Dios, are some of the people who inspired me. And their inspirations too, like Neil Young, and Brian Wilson. For me personally, my biggest influence is Conor Oberst from Bright Eyes. Also Neko Case. Since I was in junior high, when I started writing songs, they were my favorite artists. I watched them grow through their music, and it allows me to grow through my music. Poet-wise, I really like John Keats from the Romantic era. A.R. : Tell us about some of the notable acts, and some of your favorites, that you’ve shared the stage with. H.L.B. : Well, it was going to be my favorite show to play, but I actually missed it. I was going to play the tenth anniversary show for Dios, in L.A., at The Echo, and I was so excited. And then I was driving there from Phoenix, and my car broke down and I missed my set. But my friend’s girlfriend came and picked me up, and I was caught their set and I was so happy, even though I didn’t get to share the stage with them. One time I sang ‘Rosy Cheek Gal’ with Chris Doud and The Good Luck Thrift Store Outfit, and that was kinda cool. Playing with Mr. Ben & The Eye-Birds is really cool. That’s like the dream team. Bethany Joseph, Nathan Ignacio, Ben Phelps, Brook Heathcoat, Joe Scalero and Paul Muncy. They’re really great musicians around here and I’m really lucky to be playing music with them. We played a show with a couple other local bands, Stop Motion Poetry and Pacific Lung, out in San Francisco. Jenny Parrott is a favorite of mine too -from Texas bands Loves It and Meatloaf Spaceship. A.R. : You also got to sing on a recorded track with a bay area band called Alabaster & The Original Bastards. H.L.B. : Yeah, that was really fun. Steven Dodds from The Pine Box Boys is the drummer, and Alabaster writes all the songs and sings them. They’re just some ornery old men that I love. I recorded one song with them, ‘Pick Up The Phone.’ It was a duet, and I was really surprised that he picked me to do the female vocal part for that. We recorded it at Hyde Street Studios in SF. It was my first time being in a real recording studio, as opposed to my friends’ home studios. Some really famous artists like The Grateful Dead have recorded there. I was blown away. A.R. : What are some of your favorite Valley venues to perform at? H.L.B. : I like the Deva Café a lot, it’s really cool. I used to really like playing at Bound For Glory, the tattoo shop that Roy Dean used to own. That’s kind of where I first started playing. I played my own songs in front of people for the first time at that shop. Roy Dean just took me in - I was just a kid - he took me in almost like his family, and it was really nice. I miss those days. I also really like playing the River’s Edge and Rick’s Saloon in Knights Ferry, just because a lot of people I know always go out, and it’s nice. I feel like it’s the people who make the show, and not really the venue. Just who comes to support you, and who you get to hang out and talk with after. A.R. : You’ve written a song or two about Knights Ferry. That seems to be the artsy place to be, for the eastern part of Stanislaus County. H.L.B. : Yeah, well, just because, people like Will Taylor, and Good Luck Thrift Store are out there. It’s just such a beautiful place, and such kindhearted people out there. It’s hard not to go back. A.R. : You got to play Sheatherfest there, a couple of the years as well. H.L.B. : Oh yeah, that was so cool. And I did a Red Chair Recording in the river there. That was one of the first times I’d done something like that, making a music video. It was so cool, just having all those people come from across the states. When I gave Possessed By Paul James my CD, I was like, “I love you, here,” and he was like, “Oh, great! I can listen to this in the car.” It was really cool. Who else played that year…..Willie Watson from Old Crow Medicine Show. He sounded like a jukebox. He sounded just flawless. A.R. : A couple years back, you had the opportunity to visit Japan and play a few shows there. Tell us a bit about how that came about, and some of your adventures there. H.L.B. : Oh, it wasn’t like a big deal - it was just playing a local show or two. My aunt & uncle and cousins live in Japan, and my uncle’s co-worker is a musician. He plays with Japanese artists on and off the navy bases. One of the bases is in Yokosuka, where my uncle lives - it’s about a thirty minute train ride from Yokohama. I played at a different base called Ekego, about a half hour away from Yokosuka. It was for some kind of charity event. Nobody was really into it. It was a bunch of zumba moms. They were all listening to rap music on their iPhones while I was playing. Really only a couple people paid attention. But I played another show at a local Japanese bar in this place called The Honch, which is where sailors hang out. It’s known for prostitution and stuff, so it’s a cool place to hang out because it’s dirty and seedy, kinda. It’s really cool. And there were maybe like five people at the show, but afterwards, these three Japanese women came up to me bawling their eyes out, and were like “You’re so beautiful! We love you.” And I was like “Oh my god, you’re so nice.” And that was like the extent of their English. And my uncle could speak Japanese so he told them thank you for me. It was so sweet having these complete strangers who can’t even understand what I’m saying but can still recognize good music when they like it. I think those were the only shows I played there. A.R. : And the rest of the time, you traveled the islands a bit. What were some of the highlights? H.L.B. : Traveling! Yes. I love Japan so much. I stayed with my family a lot. I was there for six weeks total, so for four of those weeks I was just hanging out in the area with my family. I did a lot of stuff by myself while they were at work. Went to the park, went hiking, went to the beach. I visited a lot of temples and shrines. I took the trip right after I graduated from my bachelor’s program. My grandpa died that year, and we’d been planning the trip together for when I’d graduated. So it was kind of like I took him with me to Japan, if that makes sense. I did a lot of crying and a lot of praying. I went to Tokyo and Kyoto and Hiroshima by myself. It was kind of hard because there were signs in Japanese everywhere, not many in English, in those cities. But everyone was so nice. My favorite places were Mt. Inari, which has over two thousand torii gates - those beautiful orange gates, lined in a row for over a mile. And then you hike up to the top of the mountain, and there’s a big torii gate up there, and shrine where you can burn your incense and stuff. Sanjusangendo Hall is the longest wooden building in the world. It has 1,001 hand-carved statues of the goddess Kannon, the goddess of mercy. She’s one of the main deities the Japanese worship. It took 77 sculptors seventeen years to carve all of them, which I thought was really cool. The Pure Water Temple in Kyoto was cool too. They have a spring which you can actually drink from, and it’s supposed to be holy and bless you with grace. I saw the Atomic Bomb Dome, where the A-bomb got dropped on Hiroshima, and some of the radioactive trees. They’re still emitting radiation. In the museums there they had grafts of skin from people who got burned, so you could see how severe the damage was from the blast. And they had Sadako’s real paper cranes that she folded, which was amazing. I always loved that story, so to see it in person was so cool. I went to Miyajima Island, which has a torii gate in the water. When it’s low tide you can see the base set in the sand, but at high tide it appears to float on the ocean. I went to the top of mountain there. I really wanted to see monkeys, but I didn’t. But I went up to the temple at the top of the mountain. There’s a little stove inside with a fire burning, which they say has been burning for 800 years, ever since the monk who founded the temple first went up there. That was really cool. When I was in Kyoto, I went to a fire festival, which was a really cool thing. I went up to the temple first, and then as I came back down the hill they were getting ready. They set up all these miniature shrines on palanquins. They carry them all around the city for 24 hours, and when it gets dark at night they light torches that are ten feet long. They’re huge and it takes three or four people to carry each one. They run those all around the city for 24 hours too, and then they run them up to the temple at the top of the mountain. It shows the gods that they’re still performing their rituals, and it’s supposed to bring them good fortune for the rest of the year, and to show the gods of the underworld to stay out of the city. Those were my favorite adventures there. A.R. : You served as a counselor, and later as the arts & crafts specialist, down at Camp Jack Hazard. Tell us about your experiences there. Were you ever a camper there in your youth? H.L.B. : No, I actually only found out about the camp because the Good Luck Thrift Store Outfit played their benefit concert one year, with Brett Dennen. I learned about Camp Jack Hazard from a poster my dad made for them. I looked it up online and it seemed cool, so I decided to apply. I called the director, and he encouraged me to apply after I told him my dad had played the benefit shows and made all these flyers. Being a counselor is really hard. You’re with the kids 24/7. They get up in the middle of the night to use the bathroom, you have to get up with them. Someone hurts themselves, you’ve got to tend to them. You have to make sure they’re eating; if someone is homesick and crying you have to talk to them until they calm down. It’s really hard. I was in charge of a bunch of teenage girls. It’s beautiful up there. There’s like this spirit that inhabits Camp Jack Hazard. You go up and you’re just taken over by it. Everyone is so kind and polite. You live with these people for two and a half months in the summer, and you’re with the same people every day from the time you wake up from the time you go to sleep. You sleep next to them, we have cuddle puddles, it’s like a family. It’s really amazing. This year I was arts and crafts director. I didn’t have to spend 24 hours a day with the kids; they’d come in rotations. So it’s usually twenty kids at a time who would come, and we’d do our arts and crafts, then I send them away and the next group comes. I liked it a lot better than being a counselor. I did a lot of painting too. A.R. : Ah, yes. Let’s talk your visual art as well. You have the distinction of being the only artist who has both shared music and displayed art pieces at the same MUMfest (Modesto Unplugged Music Festival) that we organize. H.L.B. : Well, I never had any formal training. My mom went to art college, my dad’s a painter - he used to take classes in high school, now he’s a graphic artist. Neither of them really paints so much anymore. Growing up, I always did art projects with them. I was kind of a weird kid, didn’t have many friends. They always used to hang out with me a lot. I’m also an only child so I didn’t really grow up around kids. I spent a lot of time drawing, painting, stuff like that. My dad would always challenge me to come up with new ideas. The first thing I can remember him really challenging me with was when he gave me a stack of books and told me to pick three images I liked, and combine the images in a drawing. I ended up drawing a bird sitting on a lighthouse, with water around it. So no formal training. I just like painting. I come up with an idea that I want to paint and I just do it. I used to do a lot of watercolor, and still do, but I’ve been getting a lot more into acrylic pieces. I do mostly animals, especially a lot of birds. A.R. 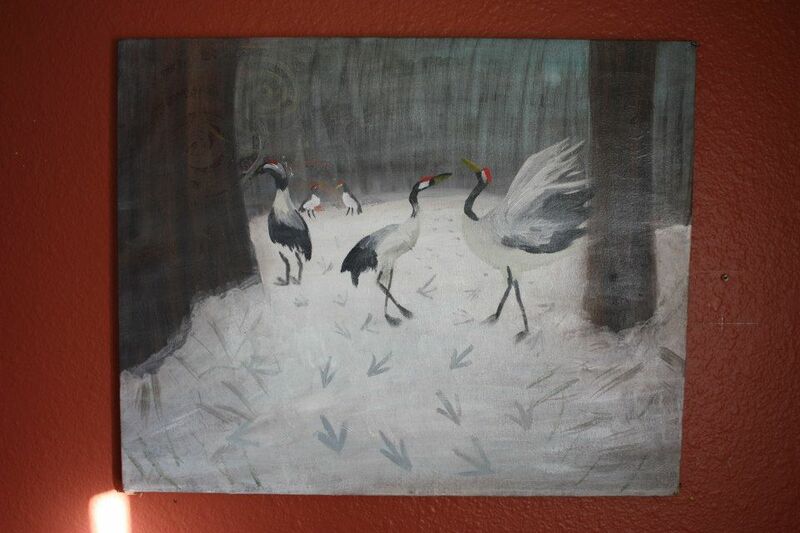 : Your scene of the cranes in the winter forest, which is in my collection, is one of my favorites from you. H.L.B. : That’s my favorite painting too. I’m so glad that you have it. A.R. : I’m surprised that you’d let it go then, if it’s your favorite. H.L.B. : I give away all my paintings. That was one of my favorites, but I also have this King of Birds paintings that I did. There’s a Sufi story about these birds who set out on a long journey to find the Simurgh, the king of birds. They fly and fly, some birds drop out, some birds die halfway through, some turn around. In the end, only thirty or so birds make it to the place where the Simurgh lives, and they’re flying over a lake, and they’re like, “There he is!” And it’s their reflection in the water, that’s the king of birds. So it’s kind of like that concept where you are god, and I am god, and we’re all god. And I did this painting of what I imagined the king of birds looked like, and my uncle wanted it, so I let him have it. Then my stepmom asked for a painting, and I did a magpie and a hummingbird holding hands, and singing little hearts out of their mouths. And I gave that one away. Most of the pieces I do, I give away. A.R. : You also do other artsy projects, like your kitted doll likenesses. One of yourself, one of Will Taylor - who were some of the others? H.L.B. : I also did Donnie and Alex from the Harmed Brothers. I wanted to do a whole series, with all of the Good Luck guys, Tom V., Soda Gardocki - but it’s so much work that I put into these dolls, hours and hours, that I just thought that if I’m going to be marketing something I make, I might as well do it for me and not all these other people. 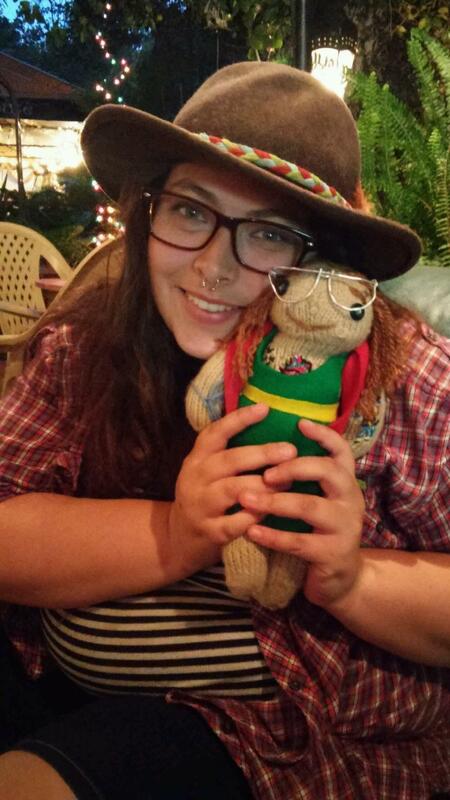 I’m going to be making a Frida Kahlo doll this year for my friend. I make more than just human dolls - I do a lot of animals too. I gave my dad some koalas, I made a couple frogs. I stole the knitting pattern for the dolls from a book I have. It’s for a gnome project, but I tweaked it around to make it my own thing. Sometimes I’ll do face painting at shows. Not that good at it, though. A.R. : What are some of your current artistic projects? H.L.B. : Nothing! I haven’t painted a picture or written a song or a poem in a year. Today’s the first time in the past year I wrote a song. And I like the song. I mean, it’s simple and it’s not like what I’d usually write. It has elements of my songwriting style in it, but it’s just like, stream of consciousness, here’s a song, I need to get this out of me. I felt like it was speaking to me for months and months, and now it’s out, and I’m so happy I could play it for you. And I’m feeling like it’s not just a one-time thing. To be honest, I was on these medications for the past year, and now that I’m off them I feel all this creativity coming back to me. I feel like myself again. It’s great. So I have a lot of ideas, a lot of things that I want to do, that I’m going to have to juggle between schoolwork and hopefully getting a job. But I feel like the more I have to do, the more I’m going to want to do it. Mr. Ben & The Eye-Birds is also a current project. We’re recording an album. We still have some parts to finish, but hopefully by winter or spring it will be out, and that’ll be really cool. We can start playing shows again. I play guitar with the band, and shaker, and bells, and sometimes sing. I would eventually like to introduce a song of my own to the band. I think that’s what we’re going for; we’re starting to transition into songs that more band members write instead of just Ben. There are so many songwriters in the band. It makes sense.